Much has been written about the children of this generation being nature deprived. Video games and indoor play have taken the place of the backyards and woods many of us played in when we were young. 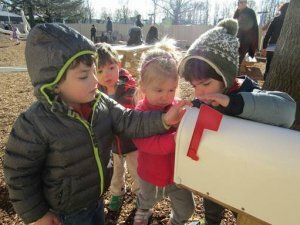 Outdoor play leads to discovery and imaginative play. It is open ended and encourages exploration. 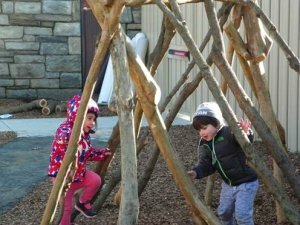 Based on the latest research and our goals for educating the children in the Bender Early Childhood Center, we are thrilled to have recently completed the first phase of a natural playscape at the Bender JCC. Last year, the staff met with a landscape architect and parents to discuss what the space should include. Conversations also took place with the children, asking them what they thought the new playground should look like, and many of the elements they suggested have been incorporated. In place of metal structures are a fallen tree and a hill to climb, and a large sand pit with a stream that runs into it from a child-sized pump. A path of different textures encircles the hill for tricycles, and two picnic tables are available for picnic lunches and small group work. “Loose parts,” circles from logs and other wooden shapes, invite children to build and imagine. The “mud kitchen” is a source for experiments and dramatic play.